After put into bat first by the Royal Challengers Bangalore, Chris Gayle and Sourav Ganguly, started the innings in the usual manner. Ganguly hit the first boundary of the match when he cut Praveen Kumar through point in the opening over, while Gayle hit Dale Steyn over point for his first four in the next over. Gayle then opened up his shoulders as he slammed Steyn for back to back boundaries in the fourth over. In the next over, Ganguly went Praveen as he dispatched a slower delivery straight down the ground for the first six of the innings. Gayle then took Praveen to the cleaner as he slammed two boundaries and a six off the last three deliveries as Kolkata raced to 50-run mark in just five overs. However, just when Gayle was looking to bat Royal Challengers, Kallis snapped up Gayle, when he was caught in the covers by Rahul Dravid for 34. The openers had put on 52 runs for the first wicket. Gayle's breezy innings included six boundaries and one six. Kallis then later on picked up in-form Manoj Tiwary, who was surprised by a bouncer and was caught by Cameroon White for duck. 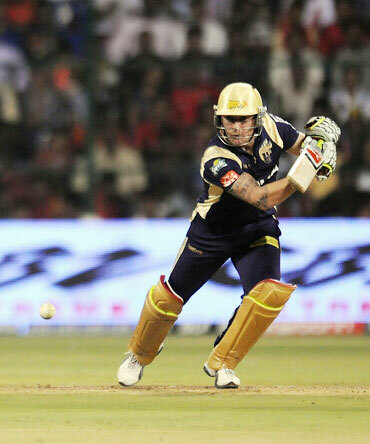 Brendon McCullum and Ganguly kept the momentum going as Kolkata reached the 100-run mark in the 12th over. However the introduction of Vinay Kumar changed the equation completely. Vinay Kumar first picked up Ganguly with a bouncer, and was caught by Anil Kumble. Ganguly made 33 runs off 32 balls. 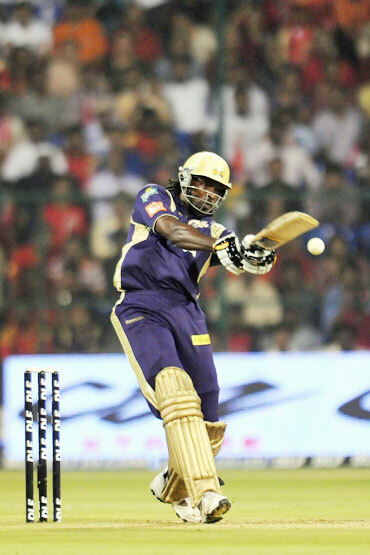 He then had Angelo Mathews playing a lose shot to reduce Kolkata to 105 for four wickets. Ishant Sharma was Vinay's third wicket, when he edged one to Robin Uthappa, finishing with three for 23 in three overs. It was not long before Brendon McCullum broke the shackles as he hit left-arm spinner Sriram for three fours and a six in his second over. He swept him for three boundaries while a short delivery was duly despatched over midwicket for a six for 18 runs in the 11th over. McCullum then helped himself to a couple of streaky boundaries and a six off the thick outside edge over thirdman to spoil Vinay's good over. The Kiwi batsman finally perished when he pulled Kumble to Vinay on the square leg fence after scoring 45 from 36 balls, having hit five fours and two sixes. However the middle order and lower middle order committed hara-kiri as the visitors lost the momentum, which they had created. Wriddhiman Saha was deceived by a slower delivery from Steyn and lofted a simple catch to Vinay at long-on. Cheteshwar Pujara did hit a couple of vital sixes in the 19th over before he was run out attempting a quick single. Ajit Agarkar then caused another run out when he called striker Ashok Dinda for a quick single after he missed the ball but the latter was dismissed by a direct hit from wicketkeeper Robin Uthappa. Kolkata finished on 160 for nine in their 20 overs having made just 36 runs in the last five overs losing five wickets in the process. Tournament's top scorer Jacques Kallis got a reprieve in the first over of the innings, when Ganguly dropped him at mid-off as he tried to loft Ashok Dinda. He was again put down, this time a difficult chance, by Pujara at the boundary ropes. However, the South African was not lucky third time as he edged one to Gyale in the slips, giving Kolkata the early breakthrough. Rahul Dravid joined Sridharan Sriram, who was making his debut in the IPL. After two good overs at the start, Ishant suffered at the hands of Dravid, who slammed him for three boundaries in the sixth over. Dravid looked in top form as he cut a short wide delivery from Mathews through point to race to 34 from 23 balls, with five boundaries. Sriram's struggle continued as he failed to find the boundaries. He, however, got a reprieve on 18 when he was dropped by Agarkar at deep square leg as pulled a short delivery from Mendis, in the 10th over. 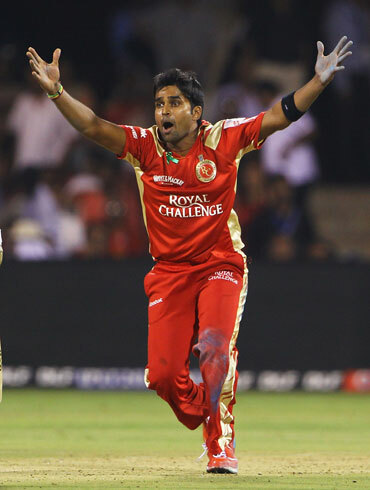 Sriram's struggle finally ended when he was bowled by Dinda after a sedate innings of 27 from 29 balls. Dravid ensured that Bangalore kept up with the scoring rate as he slammed Agarkar for back to back sixes to bring up his half-century from 33 balls. But the former India captain fell in the next over when he was foxed by the slower delivery from Mathews which he lobbed towards sweeper cover and was caught by Agarkar for a brisk 52 from 35 balls, having hit five boundaries and two sixes. It was Uthappa's time to sizzle now. Uthappa first hit Mathews for a six over midwicket, then repeated it with another mighty blow off Mendis. Ganguly's gamble to bring back the struggling Ishant for his final over backfired as he gave away 17 runs. Mendis was also taken apart in the next over with a six each for Taylor and Uthappa. Taylor swept him for a maximum over square leg, while Uthappa reverse swept Mendis for two sixes over point in that over which went for 23 runs. 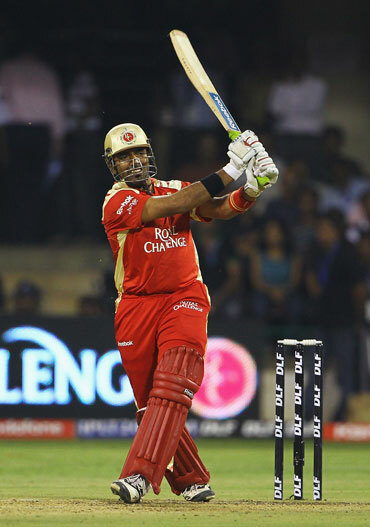 Uthappa soon completed his half-century from just 22 balls, with three boundaries and five sixes. Taylor hit the winning runs when he slammed a full toss from Dinda over square leg for a boundary to take Bangalore to 164 for three in 17.1 overs for a convincing seven-wicket victory with 17 deliveries to spare.